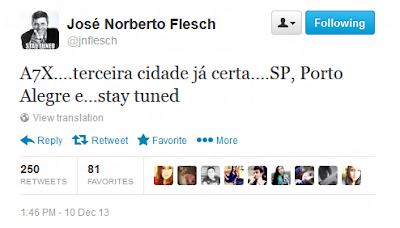 Avenged Sevenfold News: Avenged Sevenfold in Brazil in March 2014? Avenged Sevenfold in Brazil in March 2014? The journalist José Norberto Flesch, wrote on Twitter that Avenged Sevenfold will be in Brazil in March 2014. This has not been confirmed yet. Larry Jacobson, however, had confirmed that Avenged Sevenfold will play in Mexico in March 2014. We await confirmation for Brazil.